The H.Upmann Majestic is a delightful Crema, a well-balanced medium-full, 5.5” (140mm) long, of 40 ring gauge, and comes in a 25 cigars box. This new format from H. Upmann is an invitation to a short smoke of a pleasant blend, much appreciated in our modern fast paced world. 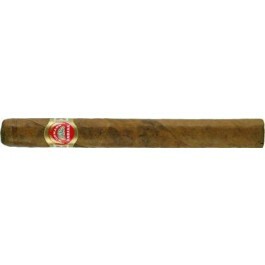 It is nevertheless a true Cuban puro, never too harsh, where the aromas are very well balanced. Perfect choice when time is of the essence. Newcomers to Cuban cigars will enjoy it as much as long time aficionados. •	With olive oil, capers and a hint of cognac, reminiscent of tapenade but balanced with toasted aged tobacco taste. •	The recommended ageing for this cigar is between 5 and 8 years. You’ll have to wait to get the best that this cigar has to offer. Buy a couple of boxes and let them rest. And you will be rewarded. Beautiful oily wrapper with a well applied cap. Saltiness and the scent of olive oil on the wrapper. The foot smells of aged tobacco and leather. A nice even burn and a pleasant draw. Hints of tobacco and vanilla with black olives. More black olive essence with an undertone of cognac. Definitely tapenade with a smoky hand rubbed leather. In summary, a fantastic cigar that you’ll want to eat. Would pair well with cognac.